When it comes to computer memory, the tiers of storage always end in mass storage as being the system bottleneck. Hard drives, colloquially referred to as spinning rust, were the dominant technology for the vast majority of computers from the 90’s. However, we have seen in the last decade, a big shift towards the use of flash-memory based solid state drives as a faster, less power-consuming, more mechanically durable alternative as prices become ever more affordable. This has meant a change in how hard drives are positioned within the market – instead of dominating all storage requirements as it traditionally has, it has been relegated to bulk storage where speed and access times are not as important. One of the victims of this shift is the Western Digital Raptor and Velociraptor series of hard drives, the last of which was launched five years ago. Its passing went almost entirely unnoticed, until I took a stroll in some of the computer shops in Hong Kong. Before the existence of the WD Raptor in 2003, the prosumer/consumer market was mostly dominated by high-performance 7200rpm IDE hard drives, and more mainstream 5400rpm IDE hard drives. SATA drives were only just coming to the market. Those looking for more performance would remember looking through computing magazines in the late 90’s at “the beast”, which would often be specified with Seagate Cheetah 10,000rpm hard drives. The problem was that such solutions were expensive owing to the use of SCSI interfaces, where a controller could easily cost more than a drive or even two. The drives themselves were also not cheap. The performance was, however, unbeatable. Because of this, the Seagate Cheetah never really saw wide adoption in home computers – I’ve never seen them myself, and as the performance of IDE drives continued to catch up to them, they became even less popular. The WD Raptor was significant, as it was Western Digital’s take on bringing server-class performance to the home/prosumer market. Instead of insisting on a more expensive SCSI (or SAS) interface, it would instead launch with a SATA interface, positioning it at the forefront of consumer-class technology at the time. It had a 36Gb capacity, 8Mb cache and 10,000rpm spindle speed, trading off some capacity for faster access times through the use of smaller platters. It was expensive, but not too expensive, thus making it a success at least for a number of years. The first WD Raptor did have a bit of an identity crisis. It was designed for IDE, and its controller ran on IDE. But in order to present an “advanced, bleeding edge” appearance, it was launched with a SATA interface. This was done through the Marvell 88i8030-TBC (and TBC1) IDE to SATA bridge chips, which meant that the drive didn’t necessarily benefit from the increased speeds of the SATA interface, and had no support for NCQ. The original bridge had only UDMA5 support, restricting throughput to 100MB/s, with the later one operating at UDMA6 133MB/s. At least, there was no chance of the drive being wired up with a slave device (as could happen on IDE buses) and needing to share bus time. The drive was launched in a time of transition, and thus had both SATA power and 4-pin Molex connections. This arrangement was termed “FlexPower”, and allowed those without the appropriate SATA power connectors or adapters to just use the regular 4-pin connector. As both are “bridged together”, connecting both options to the drive could result in current flow across rails through the drive, causing damage. Compared with 7200rpm drives, the WD Raptor was both heavier and hotter. The drive featured ribs across part of its housing as a heatsink to help dissipate the heat. The drive was also considerably louder in seeking compared to regular drives, but these were acceptable trade-offs for enthusiasts most interested in higher performance. Apparently, these compared favourably to server-class drives which were worse. The other side shows the standard flat edge, as you might expect from a regular hard drive. Like other Western Digital drives, the serial number is also positioned on a label on the outer-short-side of the drive. I came to own three units, and all of them have had a decent level of usage on them. Rather unfortunately, it seems that all three units have had reallocations, but none have ever corrupted or lost data through the process. This one seems to have some UDMA CRC Errors as well, implying occasional communication issues with the SATA/IDE bridge chip as well. When it comes to reads and writes, the result isn’t so stellar nowadays. It manages a maximum of about 63MB/s, a minimum around 43MB/s and an average about 56MB/s. The access time is about 8ms, with the write access times shorter because of caching. Today, I suspect the same level of performance can be met with a pro-grade SD card. The full suite of tests were performed, and with a figure of a few hundred IOPs being the maximum, it’s clear why hard drives couldn’t keep up with solid state drives. But that being said, it’s still a pretty impressive result to see for a hard drive. 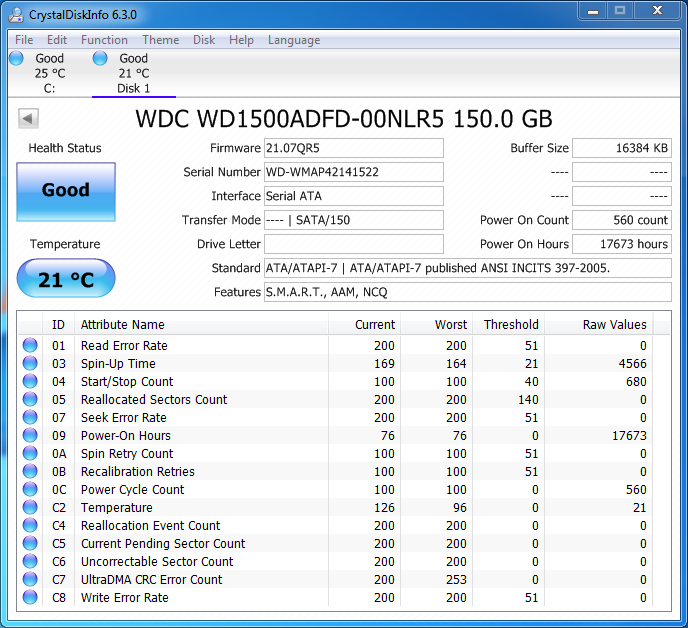 CrystalDiskMark gives us the figures which broadly agree with HDTune results. The equal results with 4k and 4kQD32 show a clear lack of NCQ ability. ATTO gives a very strong performance, with full speeds from 8kB accesses and up. The 512 byte performance is quite strong as well, because this drive predates the 4kB Advanced Format change and is thus 512 bytes native. Western Digital released a second generation drive with double the capacity a year later and much the same design. I didn’t end up buying it. But I did buy the third generation drive, released in 2006 (three years since the first generation drive) which had a capacity of 150Gb and a 16MB cache to boot. This provided quite a lot of breathing room for my OS install, and it had a native SATA interface with NCQ at last. The unit doesn’t have the mixed-tone lid on the top like the original, and has a new-style label design. There was a special edition of this drive with a clear polycarbonate window on top, but I didn’t manage to get one of them. It would have been nice though. It retains the FlexPower arrangement as the original Raptor, even though many consumer SATA drives are now on the market without such conveniences. Just like the original, there are ribs for heatsinking along one side, and the serial number label on the opposite short-side. A look from underneath shows that the IDE to SATA bridge chip is gone. Hurrah. What cannot be seen is a newer FDB motor, which meant this drive was noticeably more quiet than the original. It also proved to be even more reliable, seeing service in three different builds and clocking up some decent hours for a workstation with zero reallocations. Because of the increased density, the unit performs better with a maximum read throughput in the vicinity of 84MB/s, an average around 74MB/s and a minimum about 54MB/s with a blisteringly fast access time of 8.14ms. The write throughput is slightly lower. Again, this might well be achievable by a modern pro-grade SD card. On the whole, while the results are great for a mechanical drive, they are very much limited by the physics and thus the performance is only slightly improved from the first generation when IOPs are concerned. CrystalDiskMark reflects similar results as to HDTune, although it’s clear NCQ seems to be having a significant impacts on reads, and a smaller impact on writes. A faster sequential speed is always welcome for “bulk” transfers. ATTO on the other hand seems to report a mixed-bag of performance scores varying from run to run. This may be due to the NCQ implementation, but the drive does hit a very good 4kB read score near its full potential, and by 8kB and onward, it seems to be at its full performance. I’ll admit, I never actually purchased a VelociRaptor for use in my own builds. As a thrifty student at the time, I kept running my hardware until it either failed or was too obsolete to be worth using. However, I was delighted to come across one in a junk pile during my trip to New Capital Computer Plaza in Hong Kong. For the fourth-generation, WD changed its branding to VelociRaptor, probably to make it a little more exciting. Instead of building full-size drives, it would build 2.5″ units which were thicker than standard laptop drives, and mount them into cooling heatsink adapters called IcePacks which turned them into 3.5″ drives. The drives were available without the frame, although this was intended for use in specialty servers where the heat could be properly managed. Unmounting the drive from the frame would void the warranty. This particular unit is actually a “special” 160Gb version for HP as an OEM drive. The standard capacity for WD’s retail model originally came in 80/150/300Gb. The underside has four Torx screws, one covered by a label, that hold the drive into place. A red PCB contains the interface adapter which connects the 2.5″ drive’s SATA and power interfaces through to their standard locations on a 3.5″ frame. Some earlier IcePacks did not have this “feature” and thus were incompatible with backplanes. In the design of the IcePack, both sides have heatsinking fins. There is no serial number label on the front, but the serial number is laser-etched onto the drive which can be seen through a cutting in the frame. This generation of drive abandons the FlexPower arrangement, as by 2008, SATA was well and truly established. Rather disappointingly, the drive does not function. While it does spin-up, it clicks a multitude of times before spinning back down, suggesting possible firmware damage or physical head damage. As a result, the drive isn’t useful, but at least I do have an adapter frame. The frame has two positions where thermal pads have been installed to carry heat from the drive’s PCB. The rear of the drive is plain, but the outlines of the two thermal pads can be seen. Removing the PCB shows a bit of foam with plastic insulation, along with a set of connections for the spindle motor and head-stack assembly. The PCB has what appears to be three vibration sensors, which were surprising. Two of them are larger ones, at the extreme edges, with a smaller one near where the spindle motor connection is. The interface adapter is wired straight through. Notice the jumper block on the rear is not-connected to anything and is not necessary, but its existence is probably to simplify parts handling for the manufacturer – they can use the same connector assembly for regular 3.5″ drive PCBs as for the adapter. The Western Digital Raptor was an important part of my computers in the mid 2000’s through to the early 2010’s, providing a step-up in performance from regular 7200 rpm hard drives in a period where solid state drives were non-existent or too uneconomical to deploy as a boot drive. The diminished capacity, hotter and louder operation were acceptable trade-offs for a much more responsive system that booted quicker and started programs faster. Even though the first Raptor was a bit of a “shambles”, I came to own three units and all have been perfectly reliable despite reallocated sectors. I upgraded to a third-generation Raptor, which also proved equally as reliable but much better on acoustics. It’s unfortunate that having been reminded of the Raptors by the fourth-generation Velociraptor I picked up in Hong Kong, that it should be non-functional. Unfortunately, the Raptors have been driven to extinction, as solid state drives based around flash memory trounce the Raptor on every performance metric, while (eventually) undercutting on price, mechanical durability, energy consumption and acoustic noise. It’s sad, but also, a natural course for a non-competitive product to take. This entry was posted in Computing, Tech Flashback and tagged computer hardware, computer storage, sgjphk2017, tested, vintage hardware. Bookmark the permalink. There are also next-gen 500 GB, 600, & 1TB drives. On sale at ebay fairly cheap. The heat sinks make a nice 2.5″-3.5″ adapter and I found some cheaper than the plastic copies (with fins!!??) with drives included! See Wikipedia for a partial listing of generations & specs. I did link to Wikipedia in the article itself. As for being on sale fairly cheap, it doesn’t quite seem to be the case in Australia where I come from … part of the problem is postage costs. But I was very fond of the drives, so it’s a shame to see them go. I’d hope those who were lucky enough to get a perspex-windowed 3rd generation drive had kept them in good nick … they’re pretty special :).